Engagement begins with listening to your audience. Conduct surveys as you discuss and debate ideas to understand where your trainees stand. Trainees can vote from any device, be it smartphones, tablets, or laptops, and the results are instantly projected on the screen. More than just multiple choice. Don't restrict responses. Let your participants write freely and convey their points. Learn how a new theory or concept is received. Five stars or ten stars? They love it. 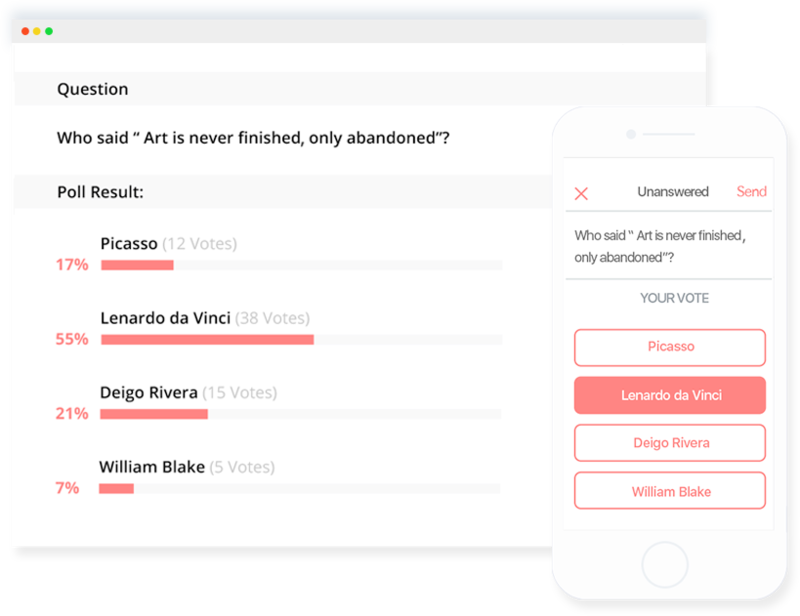 The traditional poll - enter a question and let your audience select from among many options. Transform lessons into conversations. Instead of restricting smartphones in the lecture hall, use them to improve interaction and encourage students' participation through polling. Make the most of your classroom time. Analyze and dissect difficult topics. Initiate discussions to foster class engagement. Gather different opinions around the same topic. Training employees and instructors requires implementing new strategies. The success of your program depends on how well your participants understand key concepts. Use polls to evaluate performance and measure after-class learning. Start sessions with puzzles and icebreakers. Help participants suggest topics to address. Create scenarios and test conceptual skills. Use voting to drive discussions. Receive honest answers through anonymous responses. Whether you are an entrepreneur highlighting the goals for your start-up, a keynote speaker capturing the essence of a meeting, or a training manager delivering performance reports, conduct polls during your session and take your interactions to the next level. Gather information from the crowd. Understand, explain and challenge expectations. Shape your narrative based on responses. Evaluate the strength of your message. 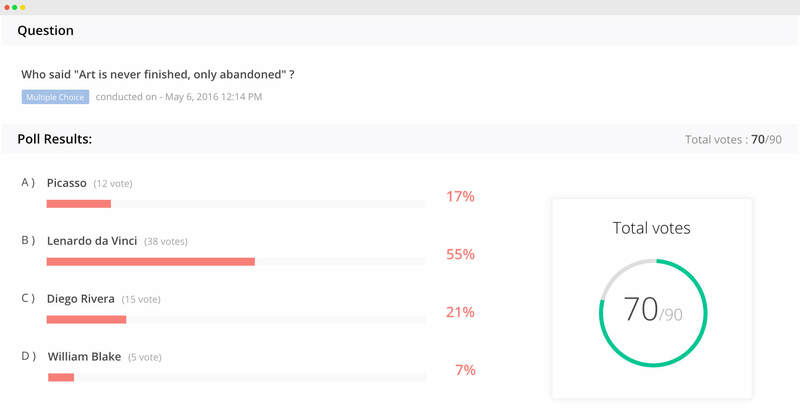 Poll analytics help trainers derive meaningful and intelligent insights based on responses received. Measure responses from both live and remote participants. Make sure every voice is heard. Recognize teacher effectiveness, measure the strengths of your students, and track their achievements and growth. Identify trends, improve business performance and predict behavior. Get peer viewpoints, facilitate knowledge sharing and enhance value obtained from the conference. Know what everyone is thinking.